I enjoyed the spoon and bake cookies so much the last time I purchased them at our school fundraiser that I ordered twice as much this time as before. Have a question about our products? Find it in our Frequently Asked Questions section. 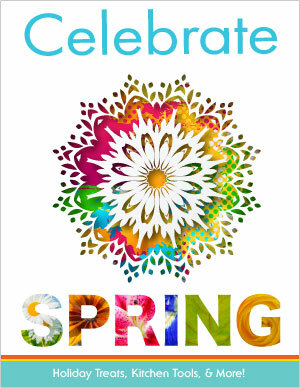 This year, get ready for spring with the Celebrate Spring fundraiser by The Goodies Factory. This sixteen-page brochure features our delicious one (1) gallon party-size popcorn bags and half (1/2) gallon family-size popcorn bags, as well as our top selling gourmet candies, gourmet chocolates, soups, and party snacks. You’ll find a wide variety of kitchen utensils and organizers to help you prepare for the perfect party. Also, don’t forget to check out our flower seed kits to make your home exterior come alive this spring! The following popcorn flavors are included in this brochure: Buttery Caramel, Three Cheese, Cinnamon Toast, Fruit Rainbow, Cheddar Jalapeño, Chicago Style, Cheddar & Sour Cream, White Cheddar, Kettle Corn, Movie Theater Butter, Cheesy Cheddar, Cookies & Cream, Chocolate Delight, and Nutty Caramel. Whether it's a school trip or new uniforms for your baseball team, anyone can do a fundraiser. The fundraisers aren't limited to only the one's schools and organizations put on. You're allowed to individually fundraise for your organization by yourself. You set up the fundraiser, you do the selling, and you earn the profits! NO MONEY UP FRONT – Choose any of our brochure sales and you do not pay for anything until the completion of your sale. Simply choose your brochure, collect the money as you take orders, pay only for the product ordered and you keep the profit. FREE ORDER FORMS - We provide all the selling materials absolutely free. We furnish color brochures, order forms and cover letters for all your sellers at no cost to your organization. AVAILABLE ANY TIME OF THE YEAR - We have a fundraising program that is perfect for any season- Summer, Fall, Winter and Spring. We are a year around fundraising company and will find a program that is perfect for your organization. FREE SHIPPING – We ship orders across the country and shipping is always free as long as you meet the minimum stated above. INCENTIVE PROGRAMS - Our incentive programs are designed to motivate students to participate in the schools fundraiser. We offer cumulative prize programs, cash back incentive, limousine rides, inflatable parties and much more. Ask your representative for more details. ONLINE ORDERING - We offer online ordering for all of your out-of-town customers. Your organization gets the profit, your students earn credit for the sales and there is no work on your part. The items are shipped directly to the customer (hassle free). PACKING OPTIONS - We offer different packing options depending on the brochure selection and the needs of your organization. Pre-packaged per student orders are available in most cases. If you have a group of volunteers you can take your order bulk,but it will still be picked to the piece to avoid any left overs. Why Choose The Goodies Factory? As a family-owned and operated business, we manufacture our popcorn and cookie dough, and ship it to you directly from our warehouse, thereby cutting out the cost of the middleman. Because of this, we're able to offer not only the highest profits available, but also several personalized services that our competitors don't offer. When you book a fundraiser with The Goodies Factory, you'll enjoy the ease and satisfaction of working with our friendly staff and knowledgeable sales coordinators.